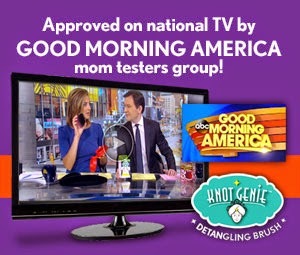 Detangling Brush is for you! The Knot Genie, Teeny Genie and Genie Supreme were created to not only to make brushing of even the most unruly hair effortless, but to create peace in your home at brush out time! The Knot Genie's unique bristles act like little "fingers" gently untangling knots and tangles. 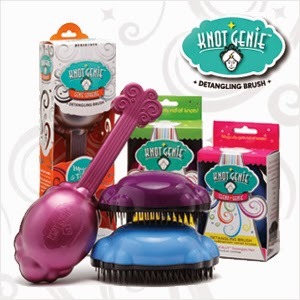 The Knot Genie doesn't have those little balls on the end of the bristles to trap knots, so they literally unravel! 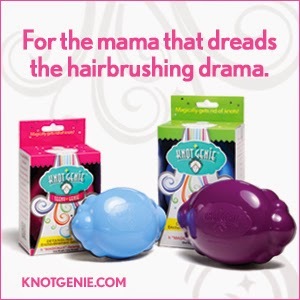 Choose from three sizes, the original Knot Genie, the Teeny Genie (perfect for small hands and small spaces like dance bags), and the handled Genie Supreme. 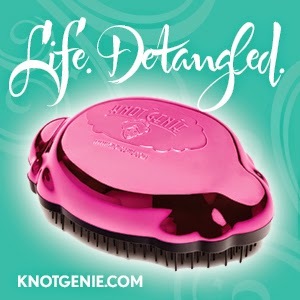 You'll be amazed by the ease of brushing, as well as how Knot Genie virtually stops breakage and split ends. It works on all hair types, wet and dry. You don't need to brush hard for the Knot Genie to work its magic, keep brushing gently and soon you will see the knots in hair disappear! My readers can save $7 on any size or color of the famous Knot Genie when you use coupon code KGDEAL7 at checkout of Knot Genie's online store (U.S store only). 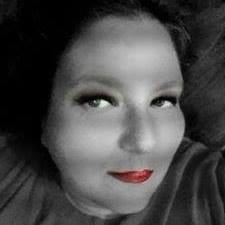 Visit www.knotgenie.com for more info and http://www.knotgeniestore.com to buy!